We live in a society where there is increasing concern over the environment and the future of our planet. Recycling has become part of our everyday life leading to great interest in innovative projects that tackle this extensive issue, even more so when other concerns are also being addressed. With that in mind, we are looking here at two skyscrapers aimed at solving the housing shortage in Mumbai (India) which use containers in their construction, part of an increasing trend for combining design, architecture and recycling. The design is based on the containers being distributed as a cylindrical, structure, creating a unique volume, with the skyscrapers’ exterior form changing with height as though twisted. This innovative form of architecture was awarded third prize in the Steel City competition. The project, managed by Spanish architect Carlos Gómez, was very well received, the jury considering it a compelling idea. Interviewed for the competition, Gómez said, ‘Cities are facing unprecedented demographic, environmental, economic, social and spatial challenges’. CRG Architects is the studio behind this fascinating project, founded by an association of Spanish architects with offices in New York, Barcelona, Lagos and Shenzhen. As explained, the concept is for two towers, one of which stands at 400 metres high, with 139 floors made up of 2,344 containers designed for housing, plus a further 1,067 used for common spaces and water tanks. 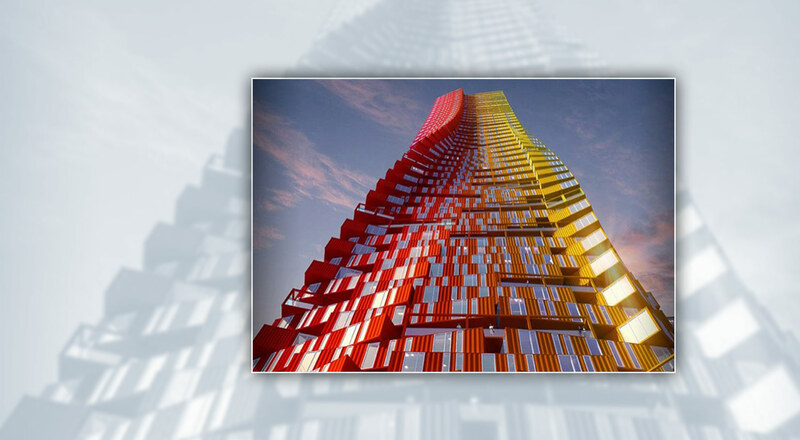 The other 200-metre-high tower features 78 floors and uses 898 containers for housing and another 290 for diverse purposes. Both use recycled shipping containers for their construction. The maximum number of containers that can typically be stacked is nine, so a main structure is necessary to reach the required height. The two buildings together will create a 105,076-square-metre residential area containing four distinct housing options, ranging in size from 33.48 m2 to 100.44 m2. The building design includes a system devised to promote heat dissipation from the containers, with vertical gardens distributed in height across the buildings together with adequate separation left between each module. Moreover, this project is based on principals of social awareness and environmental concern, tackling the issue of water reuse. The colours chosen for the buildings provide for another interesting feature; reflecting the differing degrees of solar radiation, the south side is painted with warm colours and the north with cold.